In 2007, Barack Obama spoke to the Detroit Economic Club as a presidential candidate and bluntly told Detroit’s automakers that they were building the wrong cars. Two years later, as president of the United States and chairman of bankrupt General Motors and Chrysler, Obama got his chance to build the cars he wants. 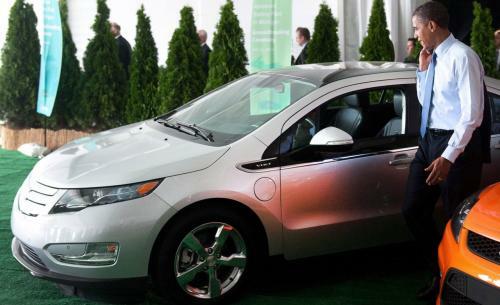 He hailed GM’s salvation as a chance to produce the electric “car of the future,” the plug-in electric Chevy Volt. And he gave Chrysler to Fiat on the condition that they would bring the tiny, 40 mpg Fiat 500 to America. Two years later, how are the Obamacars selling? “The little biscotti are not selling as well as Fiat North America . . . had planned. The 500 will probably finish out the year with sales in the low 20,000s, well short of management’s 50,000-unit prediction, apparently made at a blind-drunk Christmas party,” writesthe Wall Street’ Journal’s Dan Neill. Actually, those sales figures were the dreams of a sober, green zealot in the White House. Ironically, Chrysler’s post-bailout resurgence has come thanks to Jeeps as Fiat has learned that Americans love what Obama hates (and ridiculed that 2007 Detroit audience for): SUVs. “General Motors predicted it would sell 10,000 Chevrolet Volt automobiles by the end of the year,” reports Neil Munro at The Daily Caller, “but it is only on track to sell roughly 6,000 of these plug-in hybrids.” In 2009 supporters were predicting 120,000 would be sold in 2012. But even the 6,000 figure is worse than it appears, because many are being bought by the government itself. “On Dec. 7, for example, New York City announced it had bought 50 Volts,” reports Munro. “In November, the city of DeLand, Florida announced it was using part of a $1.2 million federal grant to buy five of the autos.” This in addition to the 100 Volts Obama himself announced the feds would purchase this May. When Obama isn’t buying the cars directly, he’s buying them through stimulus grants to utilities. “A total of 64 Volts were purchased by a coalition of 28 utility companies,” continues Munro. “The purchase is funded with $30 million from Obama’s . . . American Recovery and Reinvestment Act of 2009.” In addition, Obama is leaning on his corporate crony friends — like the head of his Jobs Council, GE’s Jeffrey Immelt — to buy Volts. GE — itself the recipient of millions in taxpayer stimulus dollars – will purchase roughly 3,000 Volts per year through 2015. And so on. Indeed, Obama has promised that by 2015 all federal vehicle purchases will be alternative-fuel cars like the Volt — on the way to replacing the entire 600,000 federal fleet. Mark Modica of the National Legal and Policy Center tells the Caller that these government and corporate purchases of Volts dull GM claims that it is selling most of its autos to ordinary consumers. ‘Considering that only about 5,000 of these things have sold, even if only. . . 1,000 have gone to townships and General Electric, you’re talking 20 percent” of sales, he notes. Even private Volt buyers are using taxpayer money. Volt customers — a not-very-99 Percent demographic making upwards of $200,000 a year (ex. : Michigan senator Carl Levin) — receive a $7,500 federal subsidy with their purchase. Obamacars are selling alright — and you, dear taxpayer, are the buyer.